Predictive forecasting is all around us. From the “smart” technology that helps in our daily lives, to the political and environmental decisions made by governments, the value of predictive forecasting is growing by the minute. It is also a top priority in businesses who want to leverage data to compete and win in today’s marketplace. The need for advanced analytics and the ability to predict what will happen in the future is growing exponentially. Because insights into future performance allows businesses to make the best decisions at the most optimal time. Today’s increasingly digital and fast-changing global business environment is putting pressure on finance to improve its forecasting capabilities as executives task finance with delivering better and faster insight to drive smart decisions. Predictive forecasting uses historical data to find patterns that can help predict future outcomes. The practice considers different values, trends, cycles and fluctuations in data, giving an unbiased understanding of key business influencers. 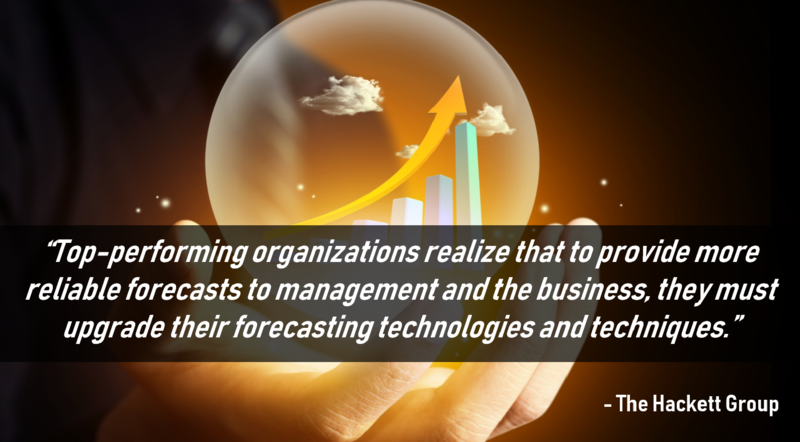 Business forecasting is essential for corporate planning, growth, and competitive advantage. It helps with estimating sales, expenditures, and most importantly, margins. With the help of predictive analytical models, business users can analyze the latest data and past data to allow them to better understand the mindset and needs of their customers and discovering potential risks and opportunities. The goal is to improve the accuracy of analysts’ business forecasts. While forecasting is a helpful way for finance teams to anticipate future events, predictive forecasting offers ways to drill into the data and show expose the granular changes that drive business performance. With this data-driven approach to the planning process, finance leaders can make accurate predictions, set the best course of action, and prepare for the real effects of the expected changes. According to the results of The Hackett Group’s 2018 Key Issues study, the number one enterprise mandate for companies today is to enhance the quality of analytics. The reason – business leaders realize that knowing what happened in the past is no longer sufficient for financial planning. Data-driven finance organizations are improving the reliability and quality of their forecasts by adopting new predictive analytics techniques like driver-based modeling. The figure above from the Key Issues study displays the finance function’s top priorities for 2018 and each priority is organized by critical priorities and high priorities. Not surprisingly, 84% of participants say that supporting enterprise information/analytics needs is a top priority, with 28% saying it is critical to their organization. The Hackett Group study found that nearly 20% of top-performing organizations already leverage driver-based models in their forecasting process. FP&A teams build forecasts using either a bottom-up process or a top-down approach. Bottom-up forecasting relies on business units to submit their expected spending for the period to build the forecast. The inherent weakness of this approach is it leaves a lot of room for human error and bias which creates inaccurate forecasts that don’t deliver useful insights. On the other hand, a top-down forecasting approach pushes projections onto business units for the upcoming periods, based on assumptions from the corporate level. This method is deeply rooted in organization-wide assumptions and historical data without considering the unique needs of the business units. In contrast to traditional forecasting methods, a driver-based approach does not get bogged down with irrelevant data. Instead, this approach is leveraged for insight into the statistical analysis of historical data to identify what factors, or predictive drivers, are most likely to affect performance in the future. This rise in the use of predictive methodologies is strongly encouraged by the introduction of new advanced analytics tools that embed artificial intelligence to build more sophisticated algorithms. Business leaders have realized the need for the ability to accurately predict what is likely to happen at a point in the future, and build plans and strategies based on that knowledge is essential to an organization’s success. However, this is only possible with a dynamic modeling tool that allows FP&A teams to not only use historical data to predict what will happen in the future, but also layer predictive analytics on top of the data for a well-rounded view of the business. ImpactECS delivers robust budgeting and forecasting capabilities that enable finance and FP&A leaders to gain an unbiased understand of key business influencers and allows them to dig deeper in their data for important insights that influence business decisions. Our solution leverages data from existing ERP systems, shop-floor, finance or production systems to build budgets and forecasts that deliver real insight. With ImpactECS, finance teams the ability to adjust or flex any model input to calculate expected results without wrangling with the challenges of spreadsheet analytics. To learn more about how ImpactECS can enable strategic forecasting in your organization, Start here! Want to see ImpactECS in action? Schedule a Demo!